Welcome to the Small Hands Creating Hope project! The lovely MaryAnne at Mama Smiles organised this project as a way of celebrating thirty years of cancer survivorship! I am so excited to be a part of this exciting fundraiser for the American Cancer Society, together with an incredibly talented group of bloggers who focus on fun, creative, and education activities for kids! 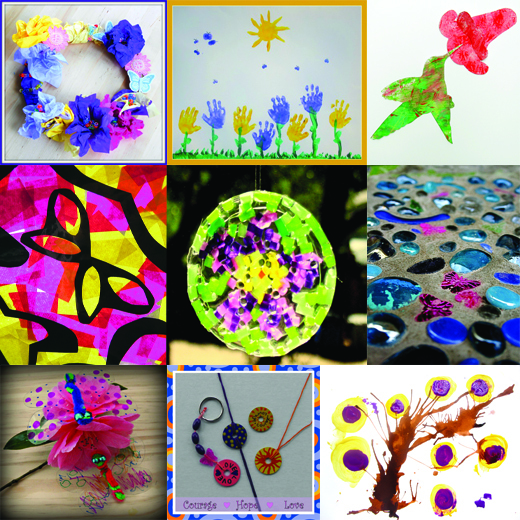 Each of us has worked with our children or students to create a craft that could be made by or for someone facing cancer. The projects are compiled in a little book so that you can recreate the crafts at home with your own children or students! If you donate but do not receive this email for any reason, or if you have trouble with the download, email smallhandsproject at gmail dot com. We are hoping to raise $3000 by July 4th, and we are running a blog hop from May 14th until July 4th to celebrate and raise funds so that, in the future, thirty years of cancer survivorship will be the norm, not the exception! Learn about each of the bloggers who participated in the book by visiting each blog on their assigned dates – a few bloggers will be running celebratory giveaways, too! 16 May B. Inspired, Mama! Thank you so much for participating in this project!